I see some parts of the skeloton. how are you feeding it? I fed mine mysis shrimp everyother day before i had to give it up to a friend who was home more often. I fed mine in a medium sized bowl of tank water using a syringe to direct inject the food. Here is a photo of mine to compare it to. I feed mine misis shrimp every day. 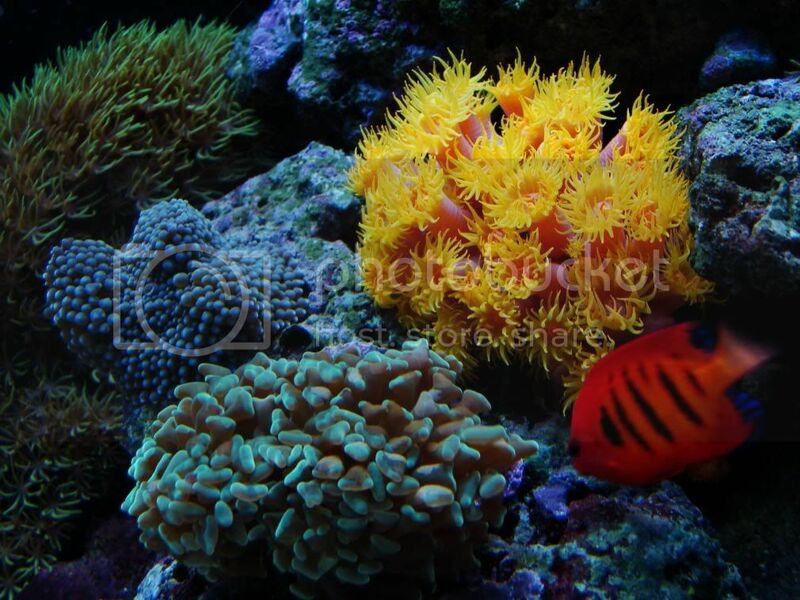 billhig1: wow thats a beautiful looking coral, how long have u had it in your tank? I have had mine for 3 months now. I had to train it to eat. I turn off all my pumps and use a turkey baster to feed each mouth for five minuts and then turn on all the pumps again. I also have a problem with the shrimps, so as I feed the coral I shoot some food at the shrimps. Just when I thought you couldn't be any dumber you go and do something like this....And totally redeem yourself! Get an empty 2liter bottle and cut the bottom off put it over the coral and then blast the insides of it and the food will stay in there and keep other inhabitants from eating the food. When I first got my sun coral the tentacles were as long as the ones in the first photo. After a while they seemed to get longer maybe my lighting or maybe cause I feed every day. They dont look to bad.I see some smaller ones coming up. They like to be fead daily and if they feed during the day your lucky as most as mine feed only at night. Mix the diet up. Marine cusine , cyclops is great and brine. They also like medium to higher flow and as long as they feed with pumps on no reason to turn them off. I have a few coral i target feed and the ony way to keep the other fish and crabs from stealing there food is cover them with a plastic bowl.I drill a hole on top to insert targeting device and a few holes on the sides for a little movement. Lighting if to high can actually be bad for them. Heres a coral care site that may help.GL. as for lighting i have 150W MH under em, but i heard that they dont need that much lighting, so i cut out a rectangle board and place it on the rim of the tank, that way the sun coral doesnt have direct light, that's the only way i can getsun coral will open up. Try placing in the shadows as 150 under a 20 is alot.And not a bottle but an oversized bowl The holes help it fill wil water and use a frag or something to wiegh it down . Leave it covered for a few hours and remove whene they are done eating.